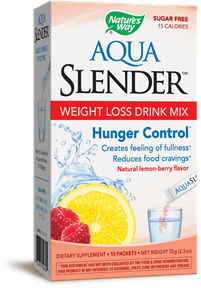 When taken 30-60 minutes before mealtime, Aqua Slender helps you feel fuller sooner with the food you are about to eat. * As a result, Aqua Slender makes it easier to be satisfied with smaller portions of food and consume fewer daily calories. Mix 1 packet into 4 ounces of water. Stir until dissolved and drink immediately. For best results, take 30-60 minutes before eating the two largest meals of the day.